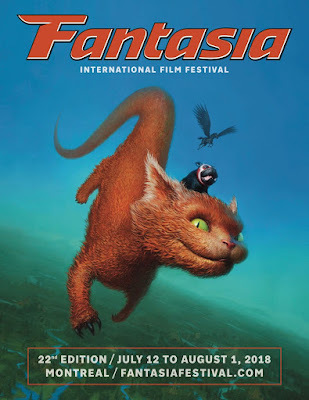 Montreal, Quebec - April 10, 2018 - The Fantasia International Film Festival returns to Concordia University, The Cinémathèque Québécoise, and The McCord Museum from July 12 to August 1, 2018, to celebrate its 22nd edition. Talented Montreal illustrator Donald Caron, who has crafted emblematic imagery for the event since 2011, has designed a whimsical new original poster for the festival’s 2018 edition. More than ever, Fantasia now provides a prominent showcase for Quebec cinema by presenting dozens of shorts by local creators, as well as a selection of feature films from Quebec. In addition, the festival pays tribute to a key figure in the Quebec film industry with its Denis Héroux Award, which has been granted since 2016 to a local creator to mark exceptional contributions to the development of genre and independent cinema in Quebec. In celebrating this, it is with great pride that the first two features confirmed for Fantasia’s 2018 edition come from both seasoned and first-time Quebec filmmakers. First up, Fantasia will showcase the Canadian Premiere of RKSS’s acclaimed Sundance smash SUMMER OF ’84 as a gala Opening Weekend event. The sophomore film from the adored Quebec filmmaking trio of François Simard, Anouk Whissell, and Yoann-Karl Whissel, follows up their celebrated 2015 feature debut TURBO KID (itself born out of Frontieres, Fantasia’s International Co-Production Market). A tense, gripping thriller set in mid-80s suburbia, SUMMER OF ’84 stars Mad Men’s Rich Sommer and stylistically displays an entirely different approach from what RKSS have done to date. A first wave of Fantasia 2018 programming will be announced in the coming weeks. Bon cinema!